A new fire station is being built in the heart of Thokoza on Khumalo Street. 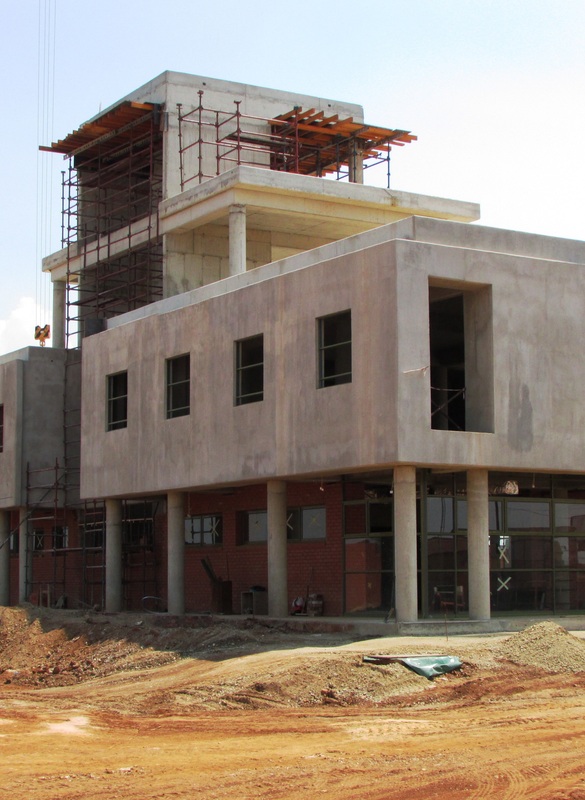 The building and civil work contractor, Buildagain Projects 203, is on schedule to complete the project on time for the Ekurhuleni Metro Municipality Disaster and Emergency Management Services (DEMS). When completed, the fire station will comprise a concrete structure building, a heavy-duty parking facility for the fire trucks, a wash bay, a generator room and first aid facilities. “The contract also includes a large area of external works,” Ravine Perumal, managing member of Buildagain Projects 203, tells SA Builder. In total the external works make up 4 500 m2 and include a concrete hardstand area, a concrete road leading from the fire station site to Khumalo Street and a parking area for 38 vehicles. “We’ve partnered with AfriSam on previous building and civil projects previously and when we saw the volumes and technical aspects of the concrete works on this contract we knew we’d be able to rely on the timeous delivery of readymix from the company as well as its reliable pumping services,” Perumal says. Significantly, Buildagain Projects 203 secured the project on open tender, and Perumal says the contractor is proud to be associated with this vital structure that will bring much needed protection to the community of Thokoza. AfriSam has supplied customised suspended slab, surface bed and foundation mixes to the project as well as G5 and G6 aggregates for the base layers of the external works. During construction of the building structure 2 500 m3 of readymix concrete was used while 1 700 m3 of readymix has been used to date to construct the external elements. “AfriSam will supply a total of 3 700 m3 of readymix to the Thokoza Fire Station project,” Amit Dawneerangen, AfriSam national sales manager Gauteng, says. “For the external works we will be supplying a total of 3 390 t of G5 and G6 materials for 6 000 m3 of layer works,” he adds. The site sits atop dolomitic ground resulting in the need for substantial raft foundations with a depth of 1 m. A total of 1 500 m3 of readymix concrete and 380 tons of reinforcing was used during the laying of these foundations. In terms of decking, the building structure was intricate as decks required multiple beams in various dimensions. “For this reason we used timber formwork that we could cut and adjust accordingly,” Perumal explains. “We used a formwork team from the local community and brought them in-house under guidance from our existing foremen,” he continues. “Our service from AfriSam has been terrific in terms of delivering on time and product quality,” Perumal states. “For a project like this, where every element is being constructed with concrete, the service received was crucial to ensure we could meet the construction programme and client deadline,” he continues. The building architecture is modern and features glass and concrete work as aesthetic elements. The floors of the three storey building will be finished with an epoxy layer and lots of the finishing components are aluminium. The ground floor of the fire station consists of offices and parking bays for fire trucks, and first-aid facilities while the first floor has ablution facilities, a lift shaft and a large volume open area for exercising and recreation. On the second floor sits the control tower and a “green” area that will become another entertainment and recreation area for firemen that will afford them a 360 degree view of the surrounding areas. Buildagain Projects 203 is a 100% BBEEE building and civils contractor founded in 2002 by Ravine and Sangeetha Perumal. It has 6CE PE & 6GB PE contractor grading from the CIDB and is a registered member of the National Home Builders Registration Council.